he restores my soul. He leads me in right paths for his name's sake. Even though I walk through the darkest valley, I fear no evil; for you are with me; your rod and your staff- they comfort me. Your prepare a table before me in the presence of my enemies; you anoint my head with oil; my cup overflows. Somehow I have never thought of myself as a sheep. In all the years I have been reading the 23rd Psalm, the full impact of that simile always eluded me. At least that was true until recently when along with the CPI pastors I was invited to dwell in that word. Perhaps it was listening to a farmer who raises these animals and his assertion that 'sheep are the dumbest creatures on God's green earth' that had made me blind to the psalmist's intention. Or, perhaps it is from being involved in ministry for the past 45 years that I have tended to see myself in the pastor/shepherd role rather than that of the sheep. Still, when you really look at it, this psalm makes clear the shepherd to sheep relationship, and identifies which side of that equation we are on. We are the sheep, or more specifically, I am the sheep. The interesting thing about this realization is that it is okay, in fact it is downright wonderful. Aren't there times, probably a lot more than we care to admit, when we need to lie down in green pastures beside still waters until our souls are restored? Aren't there times, especially for people who are involved in caring for others, when we need to be fed and nourished? Don't each of us sometimes need the oil of blessings to be poured over our heads? It is a privilege to be able to give ministry for the benefit of others, but there are also times when we need to be able (and willing) to receive. When our cup is empty, when our bodies are weary and our minds exhausted, we need to recognize that we are not and cannot be the shepherd of the world. 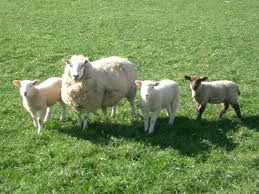 In such times it is good to accept the role of sheep and have our own needs supplied. Perhaps if more of us did that a little more frequently, we could do a better job of staying on the "right paths" and avoiding the dangerous and rocky road that leads to burnout gulch. what an excellent blog post Carman! i did a sermon on this not too long ago! there are times i need to take my own, and your advice! Ah yes, that's is the challenge of our own advice, we have to take it! Love that last line"avoid the dangerous and rocky road that leads to burnout gulch." That is an astute observation Marion. The work is intrusted to all.